Mazda's best-selling model returns with a full redesign for 2014, highlights including: all-new exterior styling inspired by the brand's latest KODO design language, complete integration of Mazda's SKYACTIV technology, new industry-exclusive safety features and an updated electronics interface. Read our complete 2014 Mazda3 review for more details. Now entering its third generation, the Mazda3 proves more than ever that compacts don't have to sacrifice fun-to-drive performance, aggressive and sporty design, or feature density. This small car packs a big punch under the hood, in the cabin and on the street, where it turns heads any place it goes. If you're in the market for a visually enticing, technology loaded compact, you'll definitely want to consider purchasing the 2014 Mazda3 in Springfield, MO. Sedan and hatchback models are available in 3i and 3s trim levels, which are further broken down into SV, Sport, Touring and Grand Touring sub-trims. Two engine choices are available, starting with a SKYACTIV-G 2.0L engine on 3i models, followed by a larger 2.5L engine on 3s trims. This year, both powerplants have integrated a new exhaust system that increases power output for a more dynamic and responsive performance. Inside the cabin, a more contemporary design, higher quality materials and updated technologies are plentiful. A new touch-screen display and electronics interface have been incorporated, along with a new set of available safety technologies. This includes a Lane Departure Warning System (LDWS), blind-spot monitoring, rear cross-traffic alert and laser-sensor powered Smart City Brake Support (SCBS) system, which is capable of minimizing the occurrence of front-side collisions when the vehicle is traveling at low speeds. Test drive the all-new, third-generation 2014 Mazda3 in Springfield today and learn more about all of this year's changes. For additional information regarding vehicle specs, please see the remainder of our Mazda3 review below. 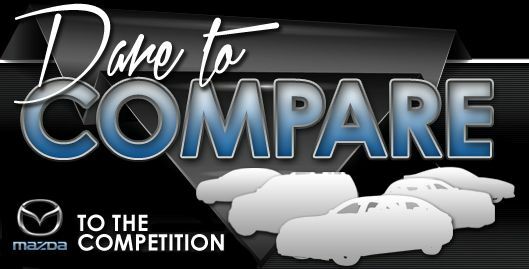 When you compare Mazda's latest Mazda3 model side-by-side with the 2014 Hyundai Elantra, Honda Civic and the Chevy Cruze, you'll find out that it outperforms the competition. If the Mazda3's user-friendly incar technologies and superb looks don't persuade you that it's the ideal vehicle for you, we're sure its affordable MSRP will. Compare its price to the vehicles in its segment and you'll see that it's a fantastic value, which is one of the main reasons why so many Springfield drivers select it. 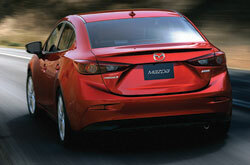 Look through our facts list to learn more about the Mazda3 - bullets under this paragraph. 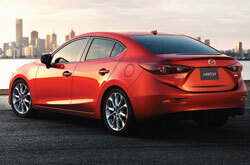 Thank you for reading our complete 2014 Mazda3 review, written by Reliable Mazda's professional authors. Seasoned automotive writers did hours upon hours of research to write the reviews on our site. Filled with beneficial information and specs, including safety technologies and other info, each paragraph gives you full access to everything Mazda's lineup has to offer. Learn all about our entire selection of fantastic automobiles! 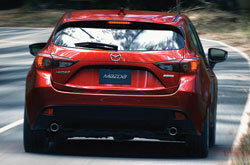 If the Mazda3 isn't the right pick for you, we've got many other Mazda reviews and car comparisons. Visit our research index page to view them now!